Fibromyalgia & Chronic Myofascial Pain, the classic survival manual, offers you the first comprehensive guide for managing the common but often misdiagnosed conditions of fibromyalgia and chronic myofascial pain. 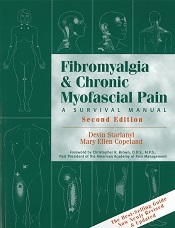 Its management techniques include targeted bodywork for painful trigger points and strategies to help you cope with the chronic pain, sleep problems, and numbing effects of "fibrofog" that occur. This new edition includes coverage of promising new research on the causes of fibromyalgia, evaluation of new treatments, complete discussions of special issues for women and men, and the latest information on medication. It includes a popular provider index, which can help you select those practitioners who will take your complaints seriously and offer knowledgeable treatment advice.